There is a lot of hype around soil health these days. As a result, the farming industry is under pressure to assess the health of soils in order to improve productivity and facilitate the growing link between soil health and sustainable agriculture. This pressure on the farmers in turn places pressure on the researcher who has to figure out the applicable combination of soil health indicators that a farmer can relate to and understand. I have been fortunate to interact with a lot of farmers and I have come to realize that each farmer has his/her own thoughts as to what is interesting when it comes to scientific research. I have also been fortunate to interact and engage with a lot of scientists/researchers in the field of soil science who have devoted their research to designing soil health assessment techniques for the farmer. Being a researcher myself, I have found it very interesting to be in the same room as the theorist and the practitioner. As a researcher, this is no piece of cake. It is very challenging to select soil parameters that are significant, ones that will build a story to tell to the farmer. I am a soil scientist by heart, and I believe that all soil properties and the parameters within the properties are very important. 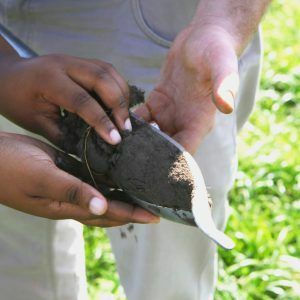 Because soil is a very dynamic system, it has dawned on me that as scientists we are far from understanding the whole story of what is really taking place in the soil. This is especially true when it comes to the soil biology side. What I do know is that we can measure soil parameters that are indicative of what is really going on in this dynamic system, indicators that I perceive as useful to the farmer.